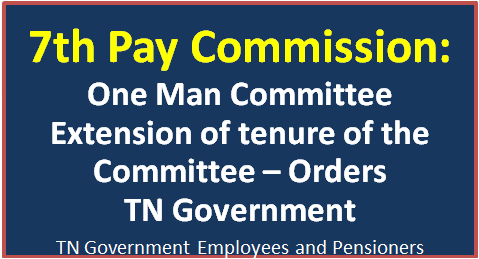 Tamil Nadu Revised Pay Rules, 2017 – Constitution of One Man Committee for rectification of pay anomalies – Extension of tenure of the Committee – Orders – Issued. 1. G.O.Ms.No.57, Finance (Pay Cell) Department, dated 19.02.2018. 2. G.O.Ms.No.138, Finance (Pay Cell) Department, dated 24.04.2018. 2. 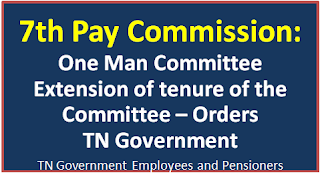 The conduct of personal hearing meetings with various Service Associations and individual petitioners is in process and as it will take some more time to finalise the report, the One Man Committee has sought extension of the tenure of the Committee for a further period of three months beyond 31.07.2018. 3. After careful consideration, Government direct that the tenure of the One Man Committee constituted in the Government Order first read above shall be extended for a further period of three months beyond 31.07.2018 i.e. upto 31.10.2018.